Please enter personalization below and enter Groom for a couple's shower. 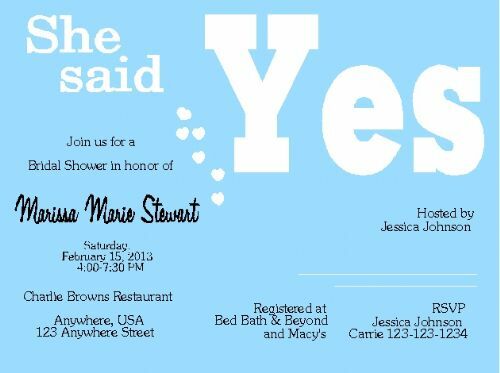 This beautiful Bridal Shower invitation features the wording She Said Yes, Our unique and modern invitation is perfect for a bridal shower invitation, save the date cards and wedding thank you cards. What a romantic and elegant invitation and perfect for the bride's special day. Our wedding shower invitations feature chic and elegant designs. What a pretty invitation this is!! All wording can be customized and the background color can be changed or taken out for no background. Please let us know in the personalization box below if you have any changes needed. Carries Kiddie Closet's bridal shower invitations feature chic and absolutely charming designs perfect for any type of bridal shower, including an afternoon luncheon, cocktail party, or afternoon tea. Our bridal selection features stunning brides, floral bouquets, polka dots, and of course our fun bride and groom stick figures. Planning your bridal shower is announcing to friends and family that your wedding day will soon be here. Make every moment leading up to your wedding day special, by beginning with your bridal shower invitations. We are here to help you in any way, simply email shoregirl1000@aol.com for any assistance with your choosing your bridal invitations. Our custom bridal invitations by Carries Kiddie Closet offers a beautiful selection of invitations at super low prices. Browse our wide selection of bridal shower invitations from the most simple to a more classic look. This is such a special day for the bride and our bridal shower invitations are the first step for the bride who is preparing for their very special wedding day. We carry many unique and exclusive designs with wide range of styles for you to choose from. Our many themes include modern bride, classic bride, couples shower invitations, garden bridal invitations, lingerie bridal shower invitations, afternoon tea invitations, bridal luncheon invitations and more. We also carry a wide selection of bridal shower party favors to choose from Share this memorable moment with your family and friends and begin by choosing a Carries Kiddie Closet bridal shower invitation.